I love Christmas and super excited that this time of year is here again - time to dust off the decorations, pull our the tree and make lists! All the lists. I love pulling out the boxes and looking through the bits we have collected over the years. The Christmases we spent before our lives were made all the more crazy and busy with the boys. The times when our tree was not full of pretty hand made decorations that they have lovingily made at school and nursery. Each year I try and add a few new pieces to our collection - just a couple of things (I have to remind myself I do not need it all!!) just a few pieces that in years to come I will look at remember this Christmas - Christmas 2016. 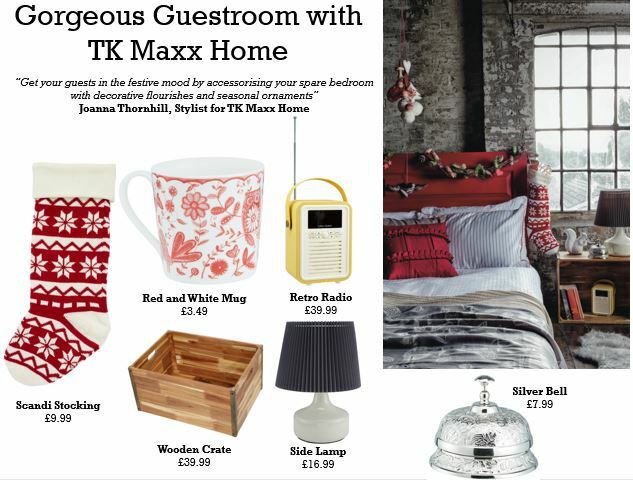 Recently the team over at TKMaxx sent me through a voucher to hit up their store and get some new pieces for this year. I must admit I have not frequented TKMaxx much in the past - I find it a bit stressful hunting around. But it clicked when I visited last week - on my own. It was not the the visit I found stessful, it was the fact I had kids involved trapseing behind me - and on a time limit. But taking time to browse the aisles on my own - well that was a bit lovely. And look at the goodies I got!! They have some gorgeous ranges which will inspire that festive look for your home. - with bare wood and pretty accessories to add some festivity to your guest room without it feeling too like sleeping in a snow globe. These individual and a little random in design baubles will really ad some individuality to your tree. They are a touch vintage chic with the bold colours but look really modern at the same time. Teaming these with some plain metallic baubles on your tree will really make them pop. And that taxi perfect little gift for any NYC or USA expats enjoying Christmas in the UK. Then something very differnet with these Nordic inspired pieces. Soft colours, fablous textures will create a lovely peaceful enviromeent to celebrate the season. Whatever your style - go take a browse in your local TKMaxx and get inspired to find a design and style that makes our heart sing.